Age-old Question: What’s to Eat? The first-century wife in Palestine—I’ll call her Martha—faced the same daily challenge that we moderns do: what to feed her family. She didn’t know about a nutritional pyramid like the one designed by the Harvard School of Public Health, but Martha made her choices loosely based on that scheme nonetheless: meat, milk, grains, veggies, and fruit. At the top of her list of menu staples was bread, usually made from wheat or barley. Every morning Martha poured grain into her mill, turned the handle with the help of her daughter, and watched the flour pour from between its discs. Sometimes she sifted it and ground it again to get the fineness she desired. Then, as automatically as getting up in the morning, Martha added water, salt, and a lump of leavened dough saved back from the day before. She kneaded the mixture into pliant dough, and put it in a warm place to rise for a few hours. Finally she shaped the dough into flat loaves and baked them in a clay oven in her courtyard. These loaves would find their way into lunches and dinners. The word “bread” is found 84 times in the New Testament and 346 times in the whole Bible, which attests to its importance. Some types mentioned are: showbread, unleavened bread, wafers (Exodus 16:31), cracknels (KJV) or cakes (I Kings 14:3), and the ubiquitous leavened bread. Martha did not have the luxury of refrigeration, so she often churned milk into curds or butter, or made a type of cheese. Chances are that none of these would taste familiar or be especially pleasurable to our “refined” palates. Martha grew many of her own vegetables, regularly carrying water from the well to keep her plants alive. She dried beans, lentils and peas, storing them in clay jars. In August and September, she looked forward to the fruit harvest of grapes, figs, and pomegranates. The local market was sure to have a good selection of what she could not grow herself. 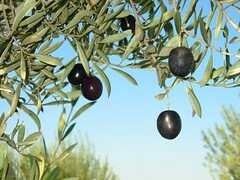 The fruit of the olive tree was harvested in the fall and then pressed into olive oil to be used in cooking, for fueling lamps, grooming the hair and skin, and for religious rites. Martha kept hers in a small earthenware container called a cruse. While Martha used salt (probably obtained from the Dead Sea area) to season her food, more importantly she used it to preserve food such as fish. She also used herbs and spices such as cumin, dill, mustard, parsley, sage, thyme, and mint to add a special dash of flavor to add welcome variety to her menu for the day. Honey, the sweetener mentioned throughout the Bible, was harvested from the hives of wild bees. Martha occasionally made another type of “honey” by boiling dates and locust beans to make a syrup. While Martha may have used other foods to supplement her family’s meals, the foods listed above appeared regularly on her table.